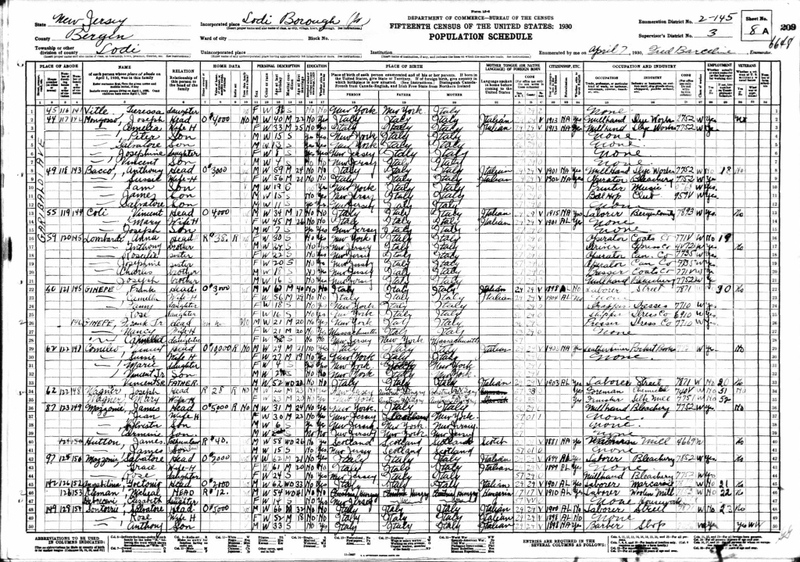 The U.S. Census population schedule for Lodi, New Jersey, in 1930. Individuals are identified by name, titles and terms, gender, age, marital status, race, relationship to head of household, birthplace, birth year, the last place of residence, and occupation. Many of the residents' last names appear to be of Italian origin. A notable resident listed in this record is Private James M. Hutton, Jr. (ca. 1914-1944), who appears on row 99. Pvt. Hutton was a private in the U.S. Army during World War II. He was born to James Hutton sometime around 1914. Pvt. Hutton grew up in Jersey and moved to Miami, Florida, sometime before 1940. He married Florence E. Offnick and had a son, James Hutton III. Pvt. Hutton was drafted into the Army on October 30, 1943, and was placed in the 157th Infantry Regiment's 45th Infantry Division. He died during combat in France on September 26, 1944, and is currently buried at the Epinal American Cemetery and Memorial in Dinozé, France. Pvt. Hutton was awarded the Purple Heart for his service. 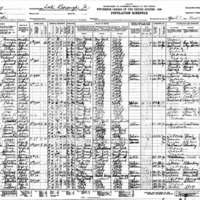 Digital reproduction of original census record by Fred Barceline, April 7, 1930. https://familysearch.org/ark:/61903/1:1:X486-1CY. Originally created by Fred Barceline and published by the Bureau of the Census. Barceline, Fred. “Fifteenth Census Population Schedule for Lodi, New Jersey.” RICHES of Central Florida accessed April 21, 2019, https://richesmi.cah.ucf.edu/omeka/items/show/6988.